I will never agree with that.. If we are talking about racial quota, then we are just another racist. What we are fighting for is EQUALITY. All racial barriers should go..
1.When all Malay schools and Sekolah Agama are fully aided, why not Tamil Schools and Chinese Schools? We are not requesting racial quota, but equality. 2.When all Malay-Bumiputera can start freely apply for government projects, why the non-Malay-Bumiputera needs to be qualified in racial requirement in getting government projects. We are not asking our shares. But we need equality. 3.When we buy a house by paying 100%, why should a Malay-Bumiputera given 7% off, regardless of whether they earn 3, 4, 5 or 6 figure income. We don't want discount. But we want equality. 4.When special programs like FELDA, created for poor Malays, why not such programs open to ALL. We are not asking racial quota in it. But just requesting them to be fair. 5. MARA's Standard and STPM standard is no way comparable. Yet, MARA student easily get into universities. But STPM students who obtained excellent results denied a course in Local Uni. They were also denied scholarship, when students who obtained just an average results got FULL PSD scholarship to further their studies abroad. We are not begging for scholarship. But just don't understand, why there are double standard? Above are just a few example of what is happening in current system. If our government is transparent, non-racist, fair to all, then Malaysian Community will exist. As long as, racist policies exist, Indians wants to secure themselves as Indians. Chinese as Chinese. and the Malays will remain Malays. The fault is not with the people. But with the system. People are ready for changes. But the system never change. We are looking for assurance. Once we are assured of EQUALITY, then I'm sure people will come out from this racial network. We need to strengthen the community first, before we build a strong nation. We can't forever sit in a comfort zone as Indians. This is just temporary shelter. We have to breakthrough racial shell in future. Before that, we shall seek for betterment. Lets improve our community in EDUCATION and ECONOMY. That will give us confidence to set free. We require no allocations and quotas to CHANGE OURSELVES. We just need few seconds to THINK. So, invest your time, Use your Brain, Arise, Awake and Act!! Video : Tan Sri Muhyiddin should resign as the Education Minister if all he will say for the Scholarship allocation fiasco is that the PSD is responsible!. 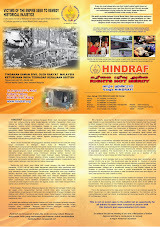 Media Event 25/5/11 (Wednesday): Filing of civil suit against Prime Minister, Home Minister, ROS KL & ROS Putrajaya to register Hindraf Makkal Shakti as a legal NGO. Filing of civil suit against Prime Minister, Home Minister, ROS KL & ROS Putrajaya to register Hindraf Makkal Shakti as a legal NGO (Note : 46,870 NGOs’ and 31 political parties can be approved except for Hindraf Makkal Shakti and HRP. Time : 11.00 a.m .
Venue : Ground Floor Lobby, Court Complex, Jalan Duta, K.L.